A little bit of both worlds: A Swedish Christmas Goat (I know, weird! 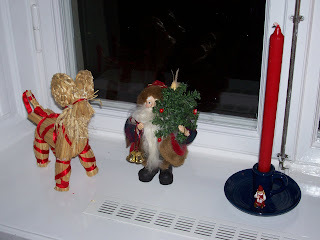 ), An American Santa Claus and a cute little Swedish flicka (girl) sitting with a julklapp(present) in her hands resting against the obligatory candle holder. I have been amused of late while watching my American friends who are wannabe Swedes posting on Facebook things about keeping Swedish traditions in America. It kind of cracks me up since I live in Sweden and am not totally into all things Swedish! I don't like glögg (Swedish mulled wine), I don't bake pepparkakor, I don't like Lussebullar, (saffron infused bakery buns eaten made especially for Santa Lucia but eaten throughout the season). Our house has a lot of candles, very Swedish, but also some very classic American Christmas elements. 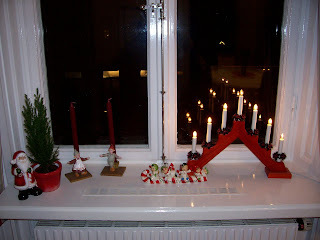 We do have the lovely advent ljuststalkar in all of our windows. It's quite cozy and lovely. But there will be no herring or lutefisk on our Christmas eve table. We could never get our money's worth going out to a Swedish Christmas dinner as too much of the table is full of fishy fish. Give me a steak cries the carnivorous American! 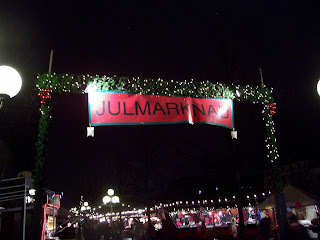 This sign seemed a bit out of place at the Jul Marknad in Kungsträdgården. 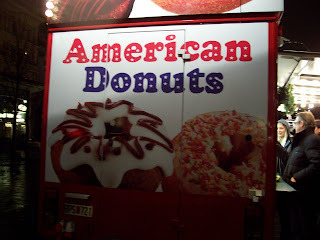 I did not indulge so I cannot tell you if they tasted like the real deal. But truth be told, I love the way most everyone puts lights in their windows to create light in the darkness. I do enjoy Swedish Christmas music. I love the Lucia celebration. And I love the Christmas markets that dot the town. I haven't had a chance to stroll through Gamla Stan (old town) yet and I have only taken a quick stroll through the Christmas market downtown at Kungsträdgården, a mere 10 minute walk from our home. I still have a lot to do before next Thursday but sometime in the next week I will take a late night stroll through town and savor the beauty of Stockholm all dressed up for Christmas. I will get down to Gamla Stan and stroll through the red shacks and enjoy looking at all things Swedish. I don't buy much any more, but in my heart of hearts, I still enjoy the atmosphere of Stockholm at Christmas. It's beautiful without being overly commercial.